While her advice is not new, Adrienne Maxwell has about as strong a pedigree to say it as anyone. She's written and edited home theater magazines at the highest levels. And while she can geek out with the best of them -- I've met her at trade events and can confirm this firsthand -- she, well, she's a girl. I'm not suggesting that men can't write about women's issues, but that women do bring inherent credibility to the discussion. Read the comments. I love the practical advice on hiring women as salespeople so that the firm can pitch men and women with gender-appropriate messaging/messengers. OK, now go back and read my column - it stands up pretty well despite its age and my gender. ...what ails the specialty AV market isn't even about technology or a lack thereof, it's about elitism and how you're not a real enthusiast unless you do (insert absurd claim here). Home Theater Review (no relation to this site) nails it. Nashville, TN. January 04, 2012: As part of its continued diversification into the music and audio lifestyle arena, Gibson Guitar Corp., the world’s premier musical instrument manufacturer, today announced a strategic partnership with Onkyo Corporation, a worldwide leader in consumer audio. With a reputation of excellence for high quality audio equipment and home theater systems, Onkyo offers Gibson’s newly-formed Pro Audio Division substantial technology resources. Gibson will provide Onkyo with its marketing resources and expertise. The result will be an ability to deliver a far superior audio experience to the consumer who has become more and more used to hearing only inferior compressed music through inexpensive ear bud headsets. Through this venture, Gibson will acquire a majority of Onkyo USA (Onkyo’s exclusive distributor for North America and a distributor for Central and South America) and become the second largest shareholder in Onkyo Corporation. Gibson will make a strategic investment in the company, and Gibson Chairman and CEO Henry Juszkiewicz will be given a position on the Onkyo board of directors. Likewise, Onkyo will invest in Gibson, and CEO and President Munenori Otsuki will take a position on the company’s Board of Directors. Together, the two entities will form a Hong Kong-based joint venture focusing on design and development of unparalleled consumer audio products. Through this alliance, Onkyo USA becomes the latest addition to the Gibson Pro Audio division, which already includes KRK, Cerwin-Vega! and Stanton. Gibson Guitar Corp. is known worldwide for producing classic models in every major style of fretted instrument, including acoustic and electric guitars, mandolins, and banjos. The Gibson Les Paul Guitar is the bestselling guitar of all time and is a tribute to the late, famed musician of the same name. Collectively, the Gibson Robot Guitar, Gibson Dark Fire, Gibson Dusk Tiger and the Gibson Firebird X represent the biggest advances in electric guitar design in more than 75 years. Through the Gibson Foundation, Gibson Guitar Corp. has become equally known for its philanthropic efforts on behalf of music, education, health and human services. Founded in 1894 in Kalamazoo, MI, and headquartered in Nashville, TN, since 1984, Gibson Guitar Corp.’s family of brands includes Epiphone, Cerwin-Vega!, Dobro, Kramer, Onkyo, KRK Systems, Steinberger, Tobias, Echoplex, Electar, Flatiron, Slingerland, Stanton, Valley Arts, Maestro, Oberheim, Baldwin, Sunshine Piano, Take Anywhere Technology, J&C Fischer, Chickering, Hamilton, Wurlitzer and Gibson Pro Audio. Visit Gibson’s website at www.gibson.com. Follow Gibson Guitar at www.facebook.com/gibsonguitar and www.twitter.com/gibsonguitar. Since 1946 Onkyo has been passionately committed to developing audio products that deliver uncommon performance, quality and value. Bundling proprietary technologies and innovations with other sound-enhancing exclusives, Onkyo continues to created award winning products that are lauded by many of the industry leading audio publications. The company's philosophy is to deliver products that are superbly designed and built to a consistently outstanding standard of excellence. The results can be seen in the obviously high quality of any Onkyo-manufactured product, even before it is turned on. Visit Onkyo’s website at www.onkyousa.com. Follow Onkyo USA at www.facebook.com/OnkyoUSA. There is no indication of price or availability, so this "announcement" is almost comically vague, but it is interesting nonetheless. For the uninitiated, MHL is a standard that aims to simplify getting content from mobile devices (smartphones and tablets) while keeping the devices charged. The MHL folks were smart enough not to come up with their own unique connector/cable; instead it uses the HDMI or microHDMI connectors, and includes HDMI backwards compatibility. It looks like Onkyo's reciever will pop up windows showing you what content is available on the device, allowing you to easily push that content on to the TV. That doesn't seem like an earth-shattering innovation, but given the dearth of MHL-compliant televisions on the market - let alone installed in homes - it could be useful. Of course, you'll need an MHL-capable phone as well. Here the news is good; there are only a handful of phones with MHL, but one of them is extremely popular, Samsung's Galaxy SII, and most of HTC's latest phones support it as well, including the EVO 3D at Sprint, Vivid at AT&T, Rezound at Verizon Wireless, and the Sensation at T-Mobile. Roku XD player is available for purchase at Best Buy stores nationwide and at BestBuy.com. With up to 1080p HD streaming support, integrated 802.11n WiFi and Instant Replay the Roku XD offers unlimited entertainment choices and incredible value to customers. The Roku XD has a list price of $79.99 and is available at Best Buy stores and at BestBuy.com for purchase today. Roku players can also be found at other leading retail stores including BJ’s Wholesale Club, Fry’s Electronics and RadioShack. Best Buy, Fry's, and the Shack. Well, the good news is that those stores are where a shopper goes if they want an inexpensive box to stream Netflix (or MLB or NBA or any of Roku's other content options). The bad news is that it won't reach consumers who don't know that they want an inexpensive box to stream Netflix (or MLB or NBA or any of Roku's other content options). Hopefully a successful run at Best Buy will get buyers at Target and Walmart interested, because their customers are who Roku should be chasing. "There are no new audiophiles entering our community any more," Abplanalp said. "For young people experiencing music, the art of building a stereo has lost its cachet. So selling headphones is a very important part of introducing music lovers to different performance levels..."
The article also notes that Monster's Dr. Dre Beats line is a key sales driver for this demographic, but oddly undersells the ability to properly demo in-ear headphones in-store. I've been on the road pretty much since the beginning of the year - first at CES and then meetings, product launches, and more trade shows. Until I have a second to breathe, here's HomeTheaterREview's (no relation) nice write-up debunking CES myths. My Last Minute, Non-Obvious Holiday Gift Guide 2010 has been posted over at Slashgear.com and includes a Home Entertainment section. First a bit of background: Kaleidescape is a high end media server vendor. They make boxes you have a custom installer put in one spot, which connect over a wired network to smaller boxes your installer connects to each TV and projector in your home. You - or your installer - copies all your DVDs onto the big box, and then you can watch all your movies anywhere in your home. Basically, it's Sonos for movies for rich people. How rich? Kaleidescape was actually the reason I instituted a policy not to review anything I could not reasonably afford. Years ago Kaleidescape offered me a full setup to review; I refused because I didn't want to take out an insurance policy on a loaner, and I didn't want to take out a second mortgage on the chance that I couldn't bear to return it. A full Kaleidescape system in those days easily topped $50,000. Prices have come way down, but most systems will still end up in the $20,000 range with installation. I had good reason to fear wanting to keep a system. 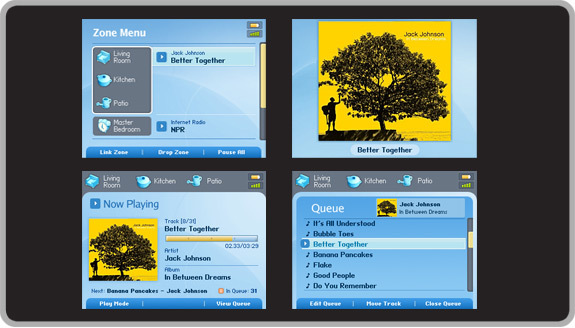 I have used Kaleidescape at trade shows and have been consistently impressed. It is fully babysitter proof and requires no technical knowledge to use whatsoever. As all the movies are ripped to the system's hard drive(s), movies start instantly. However, its one downfall is that until now it only supported DVDs, not Blu-ray discs. As many installations include equally expensive HD projectors, this is a real problem. Kaleidescape's first stab at the problem was adding Blu-ray support to the M500 player - one of the small boxes you'd have near your TV. That certainly enables you to play a Blu-ray disc (both at that TV or anywhere else in the house), but it still requires physically handling the disc every time you want to watch a movie and it is not all that much better than a regular Blu-ray player from Sony or Samsung. The whole point of Kaleidescape is access to any movie you own instantly thoughout the house. Kaleidescape is now selling a partial solution to the problem: you can rip Blu-ray discs to the hard drive in the server, and it will play off the server (which means you can include it compilation video playlists). However, to appease the copyright gods, Kaleidescape still has to physically verify that you own the Blu-ray disc before playing any of its sweet 1080p content. To do so, you'll need a media vault ($1500), the ugly box pictured on the right, which can hold up to 100 Blu-ray discs. You can add as many of these as you like, but each needs to be connected to an M-class player (like the M500). In short, Kaleidescape now allows Blu-rays to be treated just like DVDs, only there is a lot more complexity and kludginess involved. It's better than nothing, but it has to seriously pain Kaleidescape's management and engineering staff who have made simplicity and elegance a core part of the product's value proposition. The Nintendo cartdrige router should never have made it into the mix (it's awesome), but the rest of CE Pro's slideshow of consumer-submitted photos are hilarious. Custom installers, avert your eyes! Thiel Goes Amazon - Growth, or Desperation? HomeTheaterREview (no relation) is reporting that high end speaker maker Thiel will stop selling exclusively through independent retailers and begin offering some of its entry level products on amazon.com (story here) and indeed, a quick amazon search for Thiel products shows in-walls from $900, and standalone speakers ranging from $1200 - $3,000. Founder Jim Thiel passed away in September, so I'm sure there are some who are saying that Jim must have said, "not over my dead body" and the company waited until that was literally true before making the move. I never interviewed Mr. Thiel, so I don't know what his attitudes or business plans were. However, the company's basic position is pretty simple: the market for high end speakers has always been limited, but audio enthusiasts are aging, the independent dealer channel is shriveling, the recession is tanking custom installers, and competitors are moving design and production to China to lower costs. It would appear that Thiel is suffering from the same maladies as Snell. The move to a mainstream, online distribution channel like amazon is definitely risky, especially since Thiel didn't take the obvious step of first segmenting its products into distinct lines for the different channels. Thiel will have to sell enough volume on amazon to offset the fallout from angry independent dealers and custom installers. It's not clear if this is a desperation move -- i.e., Thiel's sales are down enough that anything sold online is a plus -- or if this is an attempt to position the company for growth as traditional channels are expected to continue shrinking over time, and the online channel continues to grow. In any case, simply sticking products from a relatively obscure brand up on amazon will not result in sales; Thiel will need to advertise and promote the products through the new channel. I haven't seen any new Thiel ads or promotions, have you? The problem with 3DTV - aside from the glasses and the nausea and the total lack of content - is that you need to buy an entirely new equipment chain. It is not enough to replace your TV with a 3D capable set, you will also need a 3D-capable Blu-ray player, and - much to the delight of Monster Cable - you may actually need to upgrade your HDMI cables to handle the increased signal bandwidth. The typical HDMI connection in most devices today is 1.3b, but you'll need to upgrade to HDMI 1.4a for 3D. This has implications for audio as well. If you want to get the best audio out of your 3D content, you'll need an A/V receiver (or processor and separate amplifier) to process the compressed digital signal, amplify it, and pass it along to your speakers. If your receiver - like nearly all on the market today - does not have HDMI 1.4a inputs, you will need to run a second digital audio cable from your Blu-ray player to the receiver - assuming that your Blu-ray player can simultaneously output video over HDMI and audio over coaxial or Toslink outputs. It probably can. Probably. There are also an increasing number of 2D devices that connect to your television via HDMI, and most TVs and receivers have a paucity of HDMI inputs of any kind. I have 15 devices with HDMI outputs, including game consoles, digital set top boxes, digital camcorders and several smartphones. With that background it is entirely unsurprising that electronics manufacturers are rushing to update their lines with new A/V receivers that have multiple HDMI 1.4a inputs. For example, Onkyo just announced three new receivers with 7 HDMI 1.4a inputs a piece, including the 9.2 channel TX-NR1008. Of course, this comes literally three days after I bought Onkyo's current generation receiver with 7 HDMI 1.3 inputs, the TX-NR3007 (pictured) . Now, I knew that updated versions were bound to be introduced shortly, and, having sent back all my review units, I needed a new receiver now, not in June ...but I still feel a twinge of regret. Note: the TX-NR1008 is technically a replacement for the TX-NR1007, not the NR3007 which I purchased. I'm sure the TX-NR3008 will be along shortly, along with a new TX-NR5008 flagship, which is bound to have 8 HDMI 1.4a inputs. Never have a Japanese engineer who doesn't speak fluent English give a marketing presentation to journalists. Yes, there was a lot of technical detail included, but the fundamental reason Panasonic was doing the briefing was to spin the technical detail, otherwise they would have just provided a white paper. While the presentation itself was pretty good, it was agonizingly slow going in parts, and key points just weren't made well. Plasma's burn-in issues are a thing of the past. Non-issue with current sets. Now, the legal guys haven't gotten the message, so you still see a warning in the manual not to allow static images to linger on the screen, but some of the sets are deliberately marketed as better for gaming (which they are). The manuals need to be updated and this issue needs to be taken off the table. Plasma has markedly better color than LCD, especially off-angle. Sadly, this is basically impossible to see in retail environments with uncalibrated televisions. Maximum energy usage on a plasma is still high if you display white fields all day long, but Plasma and LCD are pretty close in terms of energy consumption on real-world program material. LCD is still better (and has a much better number on the energy use sticker), but it's not a reason to disqualify plasma any more. Plasma is much, much better for resolving high definition when there is motion in the image. 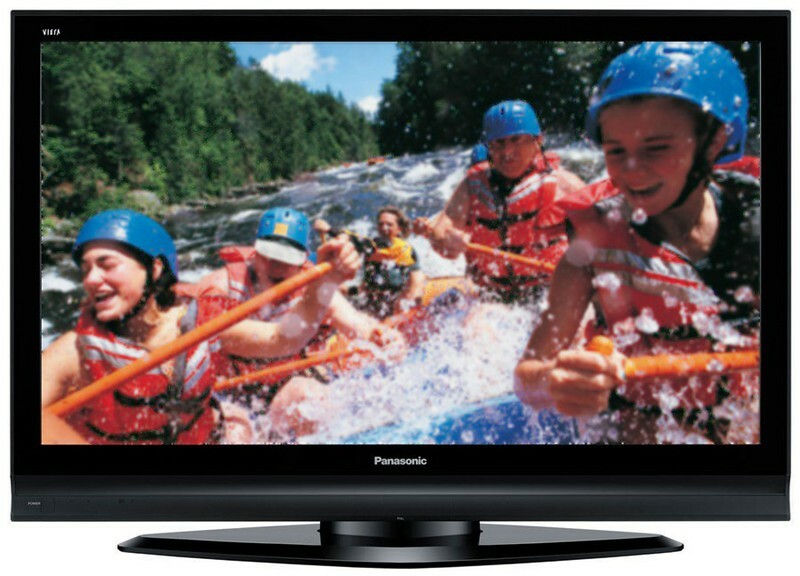 This is a key fact that Panasonic should be marketing hard, especially since the LCD competition charges more for sets that try to compensate by speeding up refresh cycles, and they are still noticeably worse on test patterns and real world content. How a TV is set up at retail is critical: the LCD set they had on hand for comparison showed more stars in a starfield, and none of us cared that the gamma of that set may have been off - there were far more stars visible on that TV than on the plasmas. And we actually know what gamma is - the average consumer never touches picture controls when they get their TV home. All in all, I came away with a better understanding of why I still prefer plasma over LCD for most uses, and why most consumers are buying LCD anyway - and are unlikely to change any time soon. I was talking with Microsoft about the XBOX 360 earlier this week, and one of the things they said will drive consumers to their console vs. the competition is the integration of multiple features into Live, such as Netflix streaming, gaming, and other content. At Current Analysis our Digital Home service covers game consoles from the perspective of connected services; we treat a PS3, XBOX, or Wii like the fancy set top boxes (that not coincidentally also play games) that they have become. However, I thought we were a bit ahead of the curve - most consumers haven't fully embraced this vision yet. But when FedEx dropped off yet another box here this afternoon, I started thinking: how on Earth am I going to connect this? Is Microsoft right - will consumers buy a game console to access digital services simply because they're out of HDMI inputs on their TV? I'm trying to integrate about eight or nine of those, and I'm not sure that there is a receiver on the planet that can handle more than about half that list. The Wall Street Journal has a great article (subscription required) quoting a recent survey showing that 50% of consumers who bought an HDTV set don't actually have HDTV service. What's more frightening - and yet entirely believable - is that 25% of HDTV owners think that they do have HDTV when they don't. Well worth a read. Apple TV Knocking off Cable? It's well argued, and there's no question that Apple TV is a TiVo competitor, but he's wrong on the cable front, so his numbers just don't add up. Alan's most compelling argument is that cable TV + TiVo is considerably more expensive than simply buying the shows you're interested in off of iTunes. However, this business model requires consumers to give up their cable TV, and that simply isn't happening en masse. For starters, cable TV allows you to discover the shows worth buying in the first place. Cable TV allows you to watch live events, like sports, or the Academy Awards, SNL, moon landings, war/terrorism coverage, and murderers driving very slowly. There are plenty of other options for getting news, but sports events have deliberately limited distribution, and generally must be consumed live (watching a game 24 hours later is like reading yesterday's newspaper. For some it is 'reference material,' for others, it's the video equivalent of what you wrap fish with). There are other advantages to having access to live (or only slightly time-shifted) content. Speaking as someone who watches a lot of TV via Netflix, the gap between watching something live on cable and watching it a day/month/year later kills the sense of community and continuity - you're completely out of touch at the water cooler. I admit that being out of touch is not as big a deal as it used to be, given the fractured TV landscape (TiVo, TV-on-DVD, TV-online, TV-on-iTunes) and work environment (I work out of a home office where there is no "water cooler," unless you count Instant Messaging). But at least with TiVo -- ReplayTV and XP Media Center in my house -- you have the option of watching live. If you turn off cable, you're at the mercy of whatever content Apple gets and when they get it. Apple TV will be additive for most people, purchased in addition to cable. Yes, it could replace a TiVo or Netflix subscription (though both have uses that the iTV does not currently address). And perhaps it could replace extended cable packages (in my own household we downgraded to basic cable several years ago and filled in our entertainment gap with TV-on-DVD via Netflix). But to make Alan's numbers work, you need to drop cable entirely... and that's just not going to happen. I will be attending both CES and MacWorld next week, but as you can imagine when you cram two shows and two cities into one week, I will be extraordinarily pressed for time. Therefore, I will only be taking meetings with clients at CES, though I will be attending most of the press conferences on Sunday. I will also be at Digital Experience Sunday night and Showstoppers on Monday night. Journalists who would like to contact me for quotes and reactions to the announcements can call me on my VoIP line: 703-788-3788 or shoot me an email at: agreengart (at) currentanalysis [dot] com. Either one will be forwarded to whatever gadget I'm carrying each day. Vizio put out a press release a few months ago for two of its 42" LCD HDTVs, touting in the headline, that Vizio is, "ONE OF THE FASTEST GROWING FLAT PANEL BRANDS IN THE U.S."
On the surface of things, that's not such a bold claim - after all, who the heck are these guys, anyway? They came from nowhere, so of course they're growing quickly. When you sell nothing one year, and something the next, your growth rate looks fantastic. So, growth by itself is not necessarily a meaningful statistic. Perhaps all the newcomers, slapping a moniker onto an LCD panel sourced from a Chinese factory somewhere, are all growing and doing well at the expense of the established brands. Makers of slim TVs are struggling with higher inventories, but the extent of the problem depends on each company's position in the market: Smaller names are facing a glut of flat-panel screens while most of the top players say they're playing catch-up to avoid shortages. So what's going on with Vizio? The key is distribution: Vizio aimed beyond the big box stores, instead targeting a different, even bigger "big box": warehouse clubs. Costco in particular is a happy home for new discount brands because the warehouse chain mixes in high end brands with relative unknowns; launching your plasma at Costco does not automatically equate your brand with discount merchandise. Of course, in terms of sheer volume, the biggest game-changer of all may be Wal~Mart, not the warehouse clubs or Best Buy. As prices drop on flat panel TVs -- easily the most desired big ticket CE item -- more of them end up in the land where there are Always Low Prices. Vendors who can make peace with Wal~Mart's margin and distribution requirements (and sometimes hyper-competitive house brands) will be able to grow their sales volumes tremendously. They may even be able to build a brand where they have none - but it won't be a premium brand. Is Going Luddite the Answer? Back in January, 2005, I posted a column asking if the speed of new technology was outstripping consumers' abilities to absorb its implications. Thanks to the magic of Google, that old column is now getting new comments, one of which spurred me to revisit the issue. The complaints are numerous: nothing works with anything else, it all gets outdated too quickly, and retail salespeople don't understand what they're selling, so there's no place to turn for advice. This reader's solution? Withdraw from technology altogether. The question of when to buy/when to wait is a common one; nobody wants to buy a product that is immediately obsolete. David Pogue's readers (see the first 20 comments or so) advise finding the right device, and just being happy with it. Aside from being preachy, this presumes that consumers already know exactly what their needs are. It also ignores the fact that computing and consumer electronics tend to plateau - when new devices will just have minor feature updates - but also make major shifts from time to time. If you buy just before a dramatically new device comes out, buyer's remorse is completely understandable. Ergo, the fear of buyer's remorse is completely understandable. Generally speaking, everything gets cheaper the longer you wait, but pricing trends are not always constant, either. Knowing when it makes sense to invest in an expensive TV/cameraphone/PC/etc. could genuinely require an understanding of the market, the technology landscape, channel constraints (the world's greatest cameraphone still needs to go through 3 - 6 months of testing at a carrier before it sees the light of day in this country), and product launch cycles. In other industries - construction, healthcare, real estate - we hire professionals to overcome design and choice complexity. Of course, experts demand payment for their expertise, and the dollar amounts and margins on most consumer electronics simply do not lend themselves to a workable business model. I cannot imagine a sustainable business where consumers pay $250 in consulting fees to help them choose a $250 device. Aggregated opinions on the web (such as Amazon.com reviews) are a big help, but are not personalized, cannot ensure everything works well together, can't help you learn how to use your new technology, and there's a lot of chaff to sort through to get to the wheat. Where the total dollar amounts are higher, a professional services model can work. The custom home theater installation market is probably the only consumer electronics area where many of these issues are addressed - for a price. But the majority of consumers buy by brand name (Bose, Apple, Kodak, and Sony all benefit from long brand associations), buy based on simplicity rather than an extended understanding of potential uses (Apple's iPod fits this category nicely), or hold off buying altogether until a category leader has been established (TiVo, iPod). But going full-on Luddite is not necessarily practical - or even desirable - for most people. For example, in my day job I focus on mobile devices. The data on mobile phones is clear: the things are way too hard to use. The data is also clear: many people consider their cell phones indispensable. One survey declared them the winner of the technology people most love to hate. So people sort of make their peace with technology and use it for a limited set of functions that they can mentally wrap their heads around. They don't know how to silence the phone, so it rings when it shouldn't. They don't know how to lock/unlock the phone (because no manufacturer will install a simple lock/unlock switch as found on every iPod) so it calls their mother by itself. But they won't leave the house without it. In last month's CEDIA Highlights post, I noted two projectors that broke through the clutter (and there was a lot of clutter: my in box has dozens and dozens of press releases). There was a third announcement that caught my eye, and, surprisingly, it, too, was projector-related. THX is now certifying home projectors. On the surface, this does not seem surprising - THX certifies just about everything. In fact, don't they already have a certification program for displays? It certainly seems like they did. (Actually, they did - but only as part of their commercial theater certification program.) THX is starting out with ludicrously expensive Runco models, but the program should trickle down to more affordable home projectors, rear projection televisions, and flat panel displays. Not everyone loves THX. First of all, it's a licensing program. It costs money to get the logo, but doesn't offer anything concrete in exchange; theoretically, if your product meets all of THX's specifications, you could be THX-certifiable without actually being THX-certified and pass the savings along to your customers. A bigger issue is that THX's specifications are based on a specific philosophy. On the audio side, the philosophy includes notions of how a speaker should be constructed (small satellites, big subwoofers, and a specific crossover type and crossover frequency), how soundtracks mixed for commercial theaters should be adapted for the home environment, and how rear speakers should be integrated into a system. Reasonable people at, say, a speaker manufacturer, could disagree on an aspect of the technical approach that THX certification demands, but because the THX logo is respected in the market, they may lose business by building things their way instead of THX's methodology. I am 100% confident that there will be controversy over THX's video specifications. I couldn't tell you what specifically will cause hand wringing - or whether it will be a specification of omission: THX's video certification program was been rightly villified several years back for certifying terrible letterbox transfers; the specs simply didn't go far enough in that case. Still, I believe that, on balance, THX is an incredibly positive force for home theater audio and video reproduction. If you assemble a THX-approved system, even from different vendors, you know that the individual products will perform to a certain set of specifications, and that they were designed to complement each other. I also appreciate the notion of a certification program in the first place. Sure, Vendor X has a good reputation, and Vendor Y has a powerful brand. But THX drives the entire industry, for better or worse, towards a unified A/V philosophy. Aside from buying every component in your system from a single brand -- as if that were even possible (outside of Sony and Samsung) -- THX assures a level of uniformity of purpose and performance in home theater products. I like that. To all the PR people trying to set up meetings with me at CEDIA this weekend: I'm not there. I just got back from CTIA before heading out again early next week, and CEDIA just didn't make it onto the schedule this year. 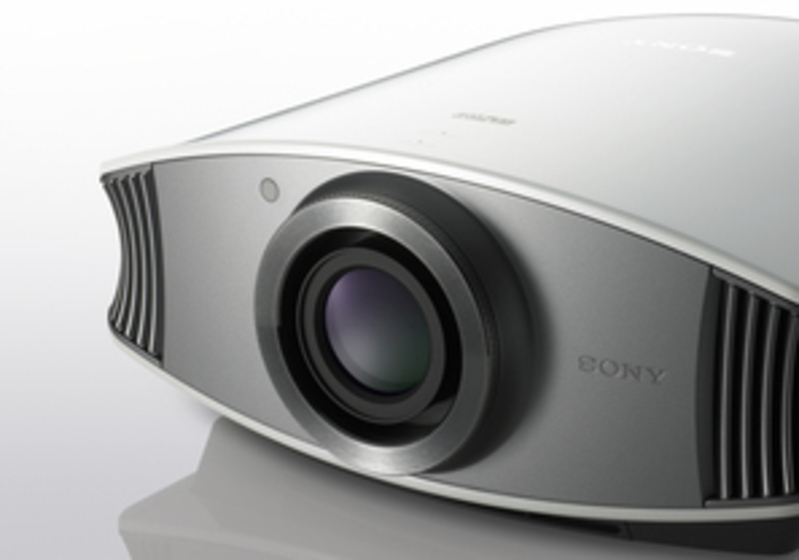 Sony's 1080p VPL-VW50 SXRD front projector, which brings essentially the same technology from the $25,000 Qualia line (that then showed up in the $10,000 VPL-VW100 front projector, and then again in a line of Bravia rear projection TVs) down to $5,000. In the U.S., where big screen TVs have long been available (along with the floor space to put them) mid-priced projectors often sell well. Overseas, where a projector is replacing a big screen TV, not supplementing it, budget projectors tend to do better. Regardless, $3,000 - $5,000 is a sweet spot for pricing, and now performance follows. Sony can claim it uses unique technology for superior image quality, which fits nicely with its brand history (and just might be true. I personally prefer the slightly smoother picture from SXRD/D-ILA technologies compared to DLP or LCD). 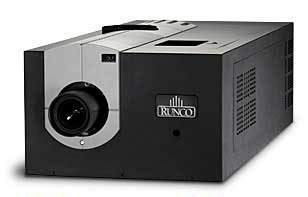 At the opposite end of the price spectrum, if you've got hundreds of thousands of dollars to spend on a Bentley, you may want to consider a Runco Signature Cinema SC-1 instead (starting price: $250K. More if you want the 2.35:1 version). And a 40 foot screen for your home theater. While you might think there is no market for such ridiculously expensive toys, think again: when I last spoke to TI, they admitted that a fair number of professional DLP products aimed at commercial theaters end up in the homes of the super-wealthy film enthusiast. Or at least the super-wealthy conspicuous consumer who needs the absolute best of everything. Sonos Tries to Market "The Experience"
Sonos has built a flash version of its music controller for online demos. 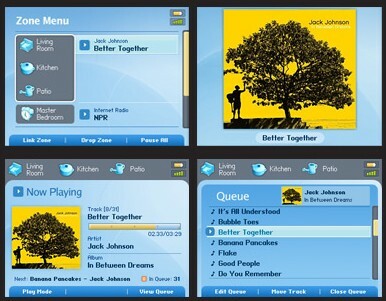 It's neat, and was probably worth the investment it took to build because the UI (depicted below) is a key part of the Sonos value proposition. However, one of the more interesting pieces of feedback I received from my Sonos review was from people who wanted to know why Sonos was worth a price premium over simply sticking an iPod and a speaker dock in each room. There are good answers to that question, but the experience is different, and that doesn't come across in an answer - or a demo of the UI. The controller isn't the experience. Having easily controlled music throughout your home is the experience, and, that may take an actual physical demonstration at someone's home to generate the a-ha! moment Sonos needs. JupiterKagan's Michael Gartenberg has a great post about the three elements needed to successfully launch a new consumer media format. He concludes that neither HD-DVD or Blu-Ray measures up. Full disclosure: I created the diagram that Michael uses to illustrate his point back when I was an analyst at what was then called JupiterResearch and he was my Research Director; it was for a report on next generation audio formats. Go back ten or twenty years, and there were two main distribution channels to bring home audio and television products to market: big box retailers, and specialty audio retailers (some of whom were branching into home theater with the advent of large screen televisions, laserdisc players, and surround sound). Today there are two more ways to reach consumers: the Internet, and custom installers, also called the CEDIA channel. To service custom installers, major distributors are gaining power. Common in the computing industry, a distributor is simply a middleman - a large wholesaler with a warehouse who takes on inventory and then resells it to retailers (or, in this case, to custom installers). Nobody likes a middleman because they add costs, but when you have a lot of small retailers placing small orders, manufacturers often cannot deal with them; enter the distributor. In the world of computing - particularly small business-oriented products, VARs (Value Added Resellers) provide a lot of the IT services used by law firms, florists, etc. When they need a network firewall or piece of software, it is far more efficient for everybody for the VAR to call a major distributor like Ingram Micro, which specializes in putting together small orders, rather than try to open an account with Microsoft or Cisco. CES isn't the primary show for custom installation, that would be the big CEDIA trade show in Indianapolis in September. But it was interesting to see how the CES Show Daily (a thick daily trade show paper produced just for CES) was chock full of distributor ads touting A/V equipment. Distributors are riding the custom installation wave, a market that is becoming seriously crowded. For starters, a lot of the independant A/V stores are having a really tough time and are essentially becoming custom installers themselves. Consumers have been putting more money towards big screen TVs, which are low margin in the best of times. To compete with the big box stores, smaller retailers often sell TVs at a loss, and hope to make up the margins on speakers, which are far more profitable. But audio sales are down - the Wall St. Journal reported earlier this month that audio sales dropped 12% last year as consumers bought more plasmas and iPods and fewer speakers and receivers. This is not true across the board; I interviewed an employee at a local high end A/V mini-chain who told me he's having a banner year. His secret: he refuses to sell plasmas without an accompanying set of slim speakers from Definitive Technologies or KEF. But when audio can't pay the bills for cut-rate video pricing, then the other option for independant retailers is to make money on services, specifically custom home installation. Electricians are moving from one low voltage specialty - custom lighting installation - to other (ostensibly similar) low voltage jobs: computer networking, whole house automation, and home theater. True, some knowledge of acoustics would certainly be useful (read: ought to be required) before an electrician is qualified to set up a home theater. But there is a definite convergence between home automation, networking, and A/V underway already, and nearly every custom A/V job requires an electrician at some point, so this trend is likely to accelerate. Finally, traditional custom home theater installation benefits from the decor-friendly plasma push. Many consumers are not capable of installing a plasma on their own: it's made of glass and must be uncrated properly, it's heavy and brackets must be mounted on studs, and it requires A/V sources to be in the right spot if a wall mount is going to look professional. Most consumers are not capable of installing in-wall speakers, which require cutting into drywall and pulling wire through walls. The main reason why distribution makes sense for CEDIA members (and their retail and trades-based company) is structural. Custom installers typically need small orders from several different manufacturers drop shipped directly to the work site on an irregular basis. This is something a distributor is designed to handle, and nearly impossible to replicate by setting up one-on-one relationships with manufacturers. Distributors are now advertising that not only do they own inventory, but they hold it at mulitple warehouses around the country to provide just in time delivery on products so that installation schedules don't slip. Distributors higher up in the food chain ("Value Added Distributors," or VADs) also take over some of the mix-and-match/training functions that can help an installer hone in on just the right doodad for the job.